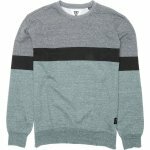 The Foamy Crew is a hip engineered stripe crew fleece. Featuring Vissla woven labels, the Foamy Crew is stylishly ahead of the curve while ready and willing to keep you toasty. Garment sand wash.